I used to not pay all that much attention to stats. They seemed to involve tricky math and fine print qualifying their results. And they didn't always cover the exact topic I was looking for, often because the data was too difficult or expensive to collect. Plus, until the last few years, stats could be fiendishly difficult to hunt down. Most of us don't want or need stats because we're writing some kind of thesis, but rather just because we "wonder." As in – after hearing a news story – "I wonder what the real stats are on that?" True, not everyone is going to wonder about stats, but even for those of us who do, we'll never get past the "wonder" if there's no easy way to find the answer to the question. In my own previously stat-deprived wasteland, I was often drawn in by and repeated to others those famous stats hoaxes. "Hey," I would interject at that boring moment of the dinner party, hoping to score me some table cred with my witty repartee and knowledge of the useless but fascinating stat, "did you hear how a woman over the age of 40 has a better chance of being killed by a terrorist than of getting married?" "Oh, really?" my (I hoped) fascinated listeners would reply. (For the debunking of this particular stat see http://www.snopes.com/science/stats/terrorist.asp which largely blames Newsweek, whose writer probably didn't mean it literally in any case, though TV shows and movies then popularized variations of the stat which began to be believed as gospel). Since becoming a criminal lawyer, I've increasingly come to appreciate the vital contributions stats play in informing all future justice policy decisions, from where to deploy a single police patrol car in Cornwall on a cold wintery night to whether national offender rehabilitation programs are working. I've thus started to make a little more effort in tracking reliable stats down. Coincidentally to my becoming a criminal lawyer, a little thing called the Internet was invented. This was soon followed by the people who produce all those fascinating stats increasingly posting them online, slowly at first and then with increasing gusto. Now you can find most government-produced statistical agency reports in full text online (rather than being buried in some inaccessible downtown reference library), and you're even starting to see some of the raw stats data being made freely available online for those with the tools to manipulate the data. 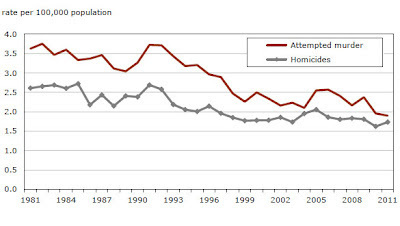 And in case you're wondering about the crime stats behind all those new stories, the trend in Canada is down down down. And unreported crime? Well, there could be unreported Martians and ghosts too! Sure, some crime unfortunately goes unreported – especially domestic-related crime – but that's always been the case. If anything, reporting for domestic crime is likely trending upwards, since the system now takes this sort of crime much more seriously. So unreported crime? Likely down as well. The cool thing about justice stats is that any member of the public can get something out of them. You'll already have heard of most of the crime categories under which the stats are organized. You'll know a bit of the geography within which they are also organized. And you may have heard of some of the policy debates which they inform. Who isn't interested in whether their city has more crime than the next city to the west or the east? Or what kinds of crime are popular? And so where do you find those wonderful justice stats? In Canada, Statistics Canada is the main collector and purveyor of data, which is perhaps not too surprising. What you might be surprised by – at least I was – is just how well organized, presented and available all that data now is through free online access. The Stats Canada Uniform Crime Reporting Survey may be the most comprehensive of the annual surveys, with the report on 2011 crime across Canada recently released. Juristat is one really fascinating product that could best be described as a monthly (more or less - sometimes there are several issues in a month) crime stat magazine, that gives readers detailed justice statistics analysis by topic. 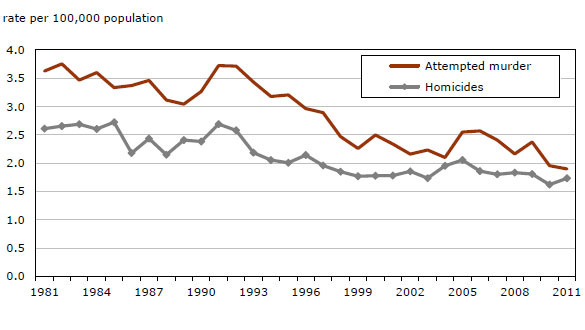 The Canadian Centre for Justice Statistics (part of Stats Can) also produces a "Profile Series" which focuses primarily on victim-related statistically-based reports. The Department of Justice Canada also has its own research division which produces reports. The Correctional Service Canada likewise has a research branch which produces reports mainly devoted to managing and rehabilitating inmates. Without these kinds of stats, none of us could possibly know how well-founded or baseless our fears of crime really are. Or whether the programs on which our governments are spending our tax dollars are really accomplishing anything to address crime.